Featuring air deliveries from 210 to 460 l/min, drive powers ranging from 1.1 to 2.2 kW, 10 bar working pressure and available in three-phase or single-phase versions, Kaeser&apos;s «Classic" series reciprocating compressors meet a wide range of workshop compressed air needs. 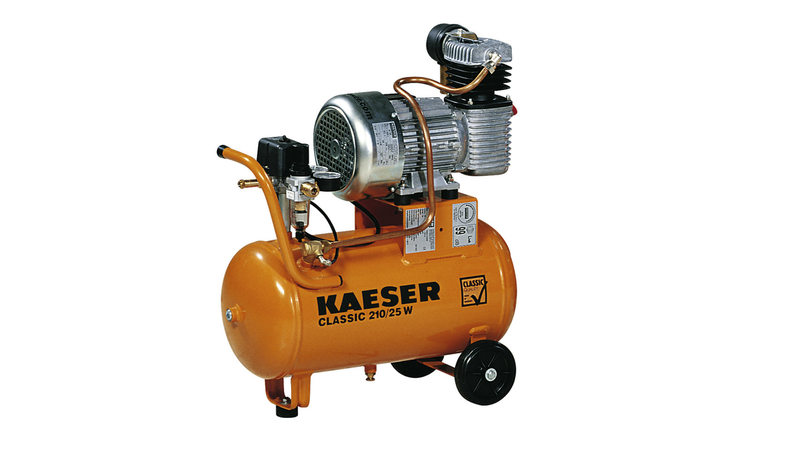 The philosophy behind Kaeser&apos;s «Classic» range of compressors is just as simple as it is successful. As the name suggests, the units have a classic design i.e. the drive motor and compressor block are mounted on a horizontal air receiver, which is equipped with two wheels and a transport grip to provide easy portability. The use of standardised components and a focus on popular models results in an uncompromising combination of exceptional value and outstanding quality. «Classic» series compressors are constructed from the very best materials and are meticulously assembled to ensure years of reliable service. Just as impressive as the proven product quality and the robust design are the long service intervals, as the special high performance compressor fluid needs changing only every 1000 operating hours. In total, the «Classic» comprises 15 models. Air receiver capacity varies between 10 and 90 litres depending on compressor performance. Therefore, with such a wide selection, there&apos;s a «Classic» series compressor to suit every workshop compressed air need.